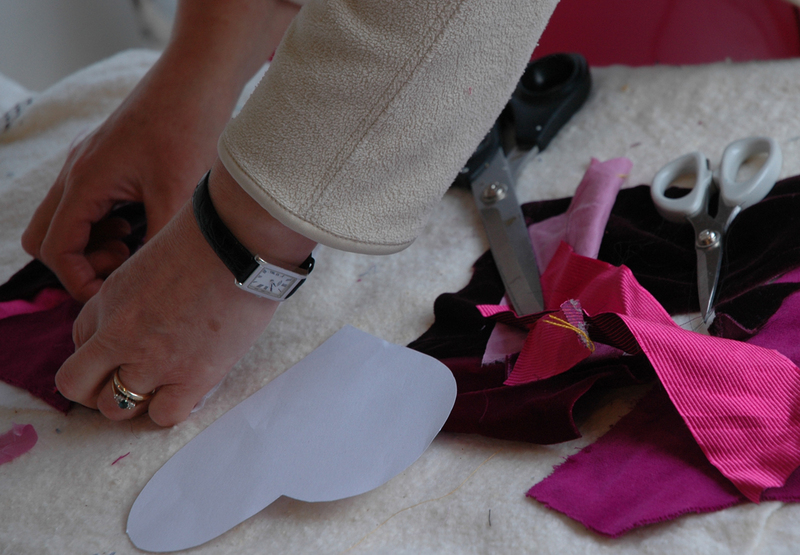 Although I have not set out to just make hearts at the classes at Heart Space Studios they are proving very popular in several different textiles workshops. 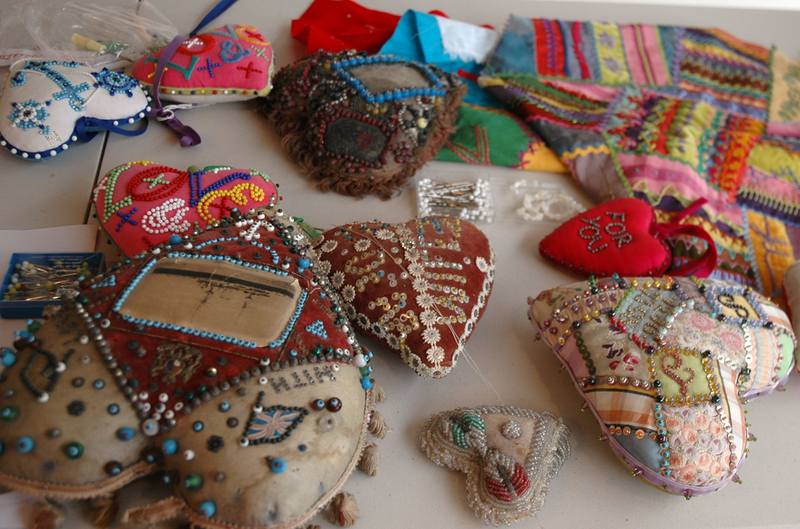 I decided to make my first teaching workshop on how to make the stuffed and beaded hearts that were popular to give as love tokens or birth presents in the late 19th century. Hand made with pinned patterns and messages they were often made by men away in the forces as presents for those left behind. 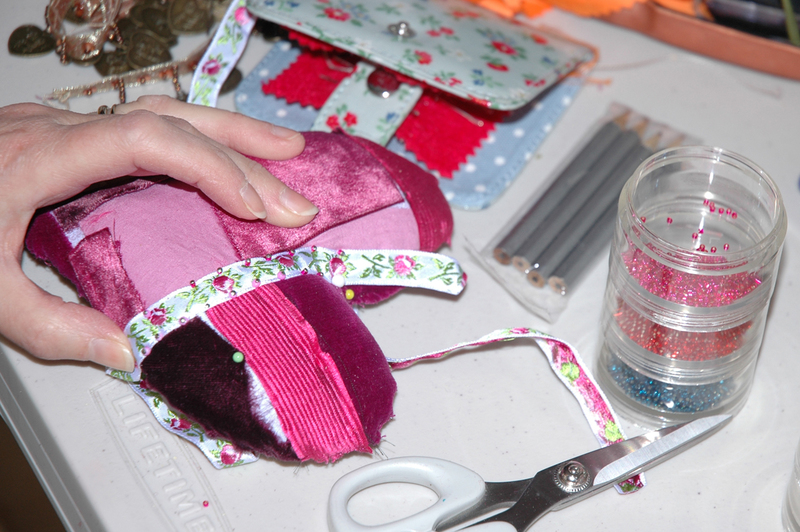 Now they make small gifts for all sorts of occasions and are highly pleasurable to make. But before the fun of pinning the beads starts you have to make them and this takes quite a bit of manipulation and a lot of sawdust. They need to be so full that a straight pin will stay put when stuck into the surface to hold the beads. I always have to stuff and stitch them several times to get the tension correct. 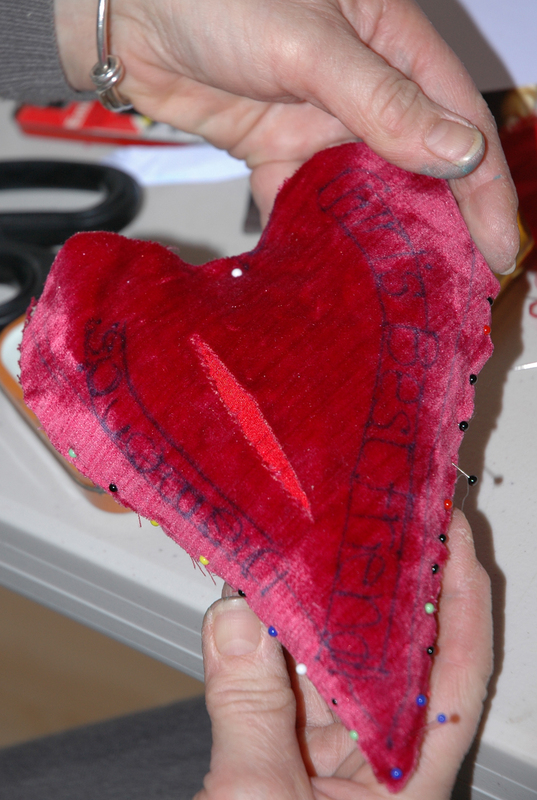 They also need strong stitching to hold the stuffing in and I always like this “scar” that is made – it looks very surgical and one of the hearts made at this class retains this scar idea on the front of the finished heart to great effect. stitches holding sawdust in place. 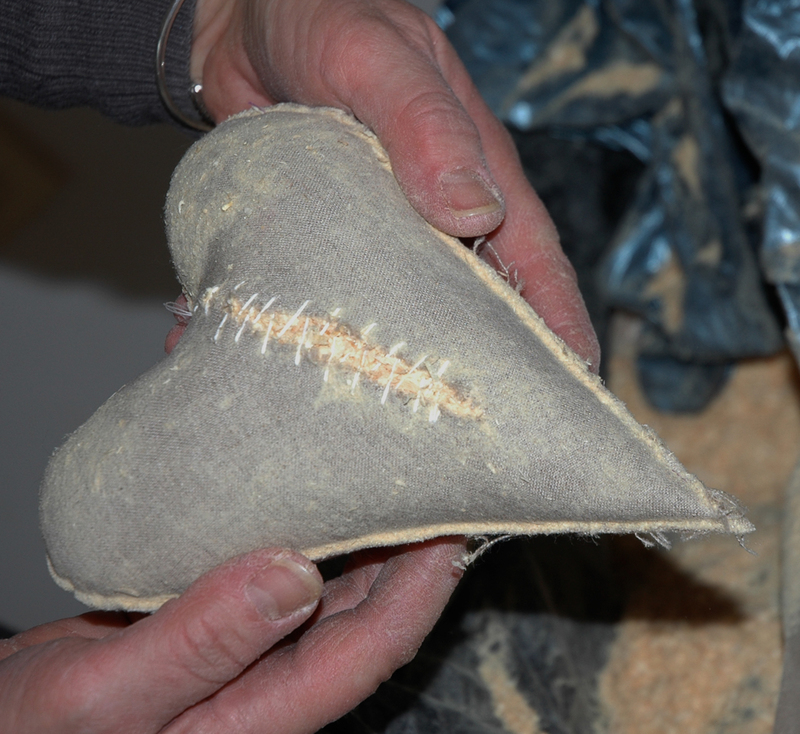 Getting a good shape to the hearts takes some pulling and punching as well as a few retaining stitches, it was interesting how different and individual the hearts looked even at this stage. Maybe we all have a perfect heart shape within us. pinning messages in place on Crazy patchwork base. 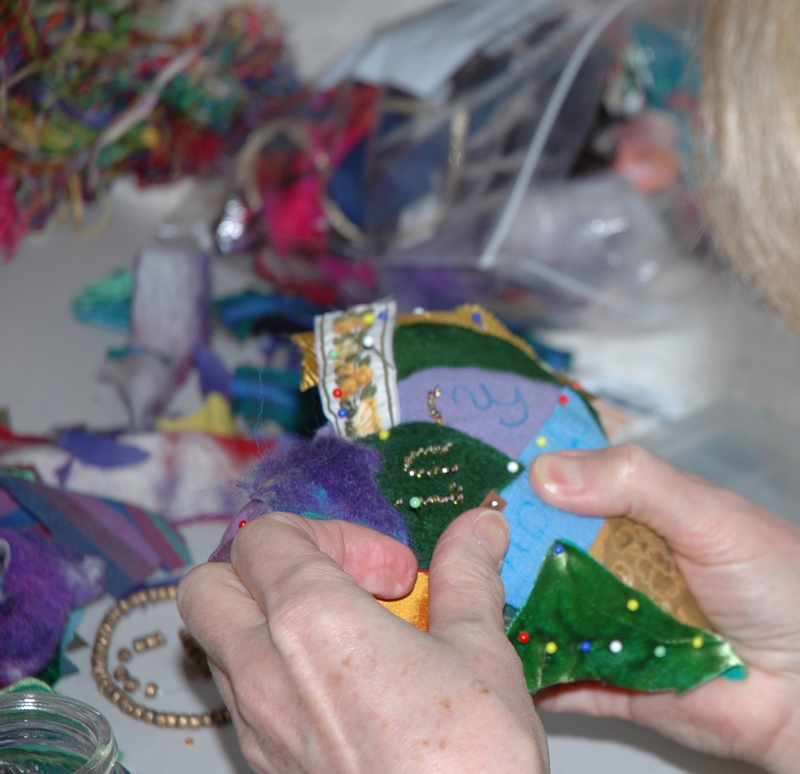 Two of the class decided to make “Crazy” hearts – small pieces of fabric are pinned into place and them the edges covered with ribbons or beads. One of these hearts was made by a mother for her son who is a soldier, and she made it to remind him of home – a nice reversal of the original soldier and sailor makers sending them home. Another heart had a message pinned in to it a rueful comment about the maker, first the message needs to be written in place though and this is quite a tricky piece of designing so it is back to the drawing board before she was able to get her message to fit perfectly in the elegant shape. The finished heart was brought to me to photograph later when she had finished it – I like the difference the livid scar gives to the well-known saying. 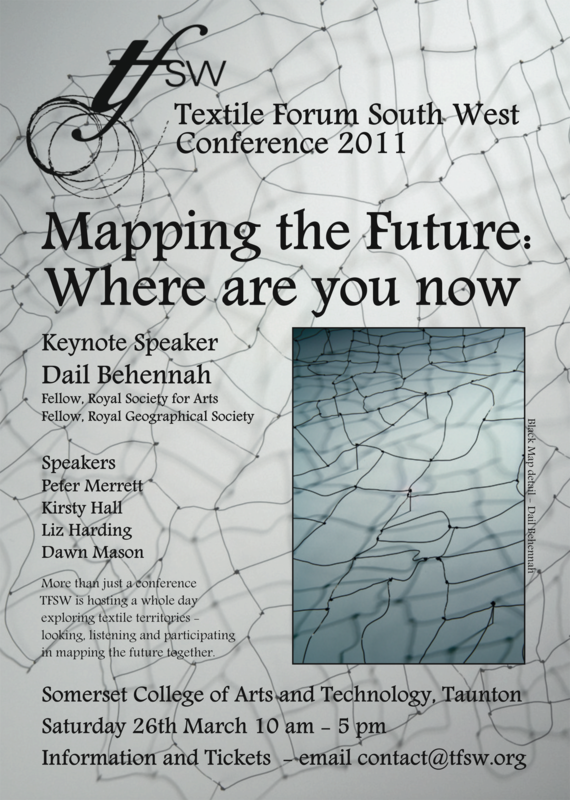 By coincidence Jan Connet and Liz Hewitt, 2 of the makers shown in the post are responsible for organising a conference for TFSW to be held later this month in Taunton Somerset it involves Mapping and Networking and as I chair TFSW I am shamelessly adding the flyer to this post in the hope of attracting even more people to enjoy a textile networking day. And by an even happier co-incidence the mended ceramic pitcher shown in “mending goddess fights back” will also be exhibited. Categories: Heart Space Studios, Hearts, Pin Cusion Hearts | Permalink. 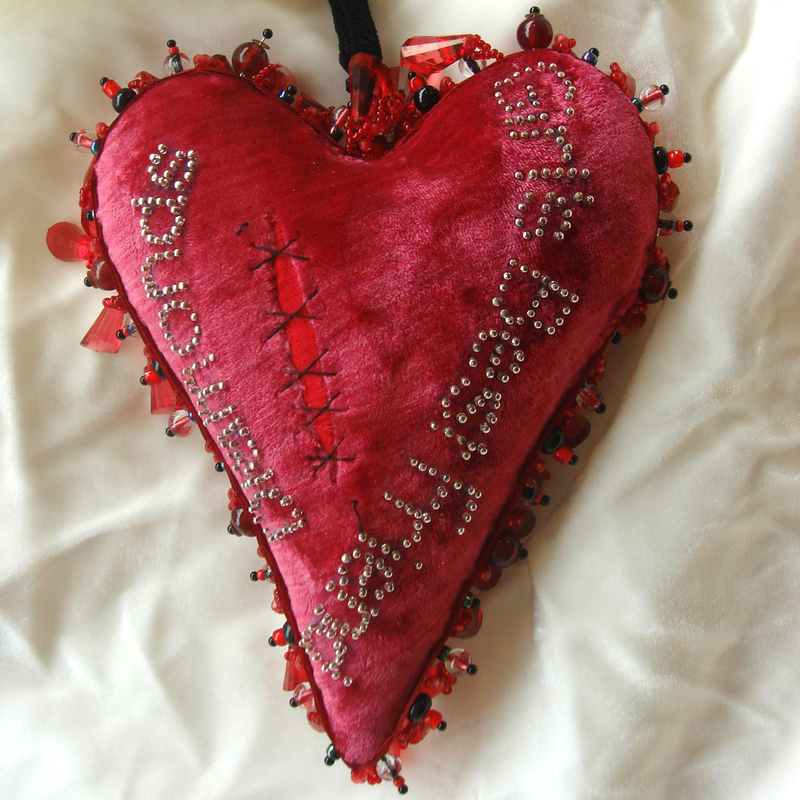 I love anything heart-shaped and I love the idea of mending hearts. i would love to make a heart to hang at home, with a few words pinned to it.